In a nutshell: Best 4K ever, congrats! yeah. ya do a great job. really nice. Way to go Gunnar & Alex, wundervoll! It really shocked me the first time I've seen it. Maybe the only negative point is the boring screens with the plain writer between the scenes. Still, it shows there can be much more impressive 4ks in the C64 with cool generated textures and 3d scenes. 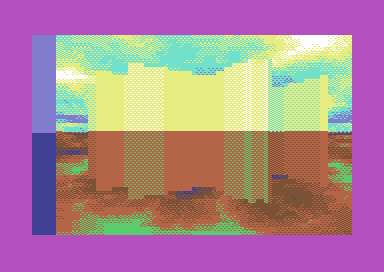 Maybe the nicest landscapes I've ever seen on the C-64, and the soundtrack adds to the feeling. Brilliant! The voxel is *really* goodlooking. Hornet: If they won't let Windows die, why would we let the c64 die? comes with source - nice move. i think c64 prods should only use the black, greys and whites really, but hey these are some cool routines. the text parts were a bit long though, but I guess some precalc was done there or something. Almost as amazing as Error23, but it's too long and gets boring ... better design next time. I love you Krill&Fanta! This is outstanding! oh gorgot to thumb this... MASSIVE respect to krill and fanta! Unbelievable! The pinnacle of size coding on the C64..
wasn't there a planet scene like that in 1000000 lightyears too? Anyway, superb sizecode work, probably the best 4k on any 8-bit platform. rulez added on the 2009-02-05 09:44:13 by ɧ4ɾɗվ. Universe contained in only 4095 bytes able to release on so small amount of RAM. Incredible trip! rulez added on the 2013-07-27 16:11:33 by w00t! i really like the soundtrack and pace of this one. rulez added on the 2014-03-23 00:06:23 by JAC! Honestly this probably would've been a lot better had it been half length, or in some other way more concise. The only weakness in an otherwise spotless intro. This is near perfect as far as the balance between presentation, aesthetic and technicality goes, masterfully exploiting the characteristics of the hardware and incorporating them into the aesthetics. Top top top. scenes are a bit long but wow! 4k! Wow, and all that in 4k. page created in 0.021626 seconds with 15 queries.